It has been a while since I have watched a gymnast from Australia live. The 18-year old from Brisbane, Danielle Prince, was certainly an interesting competitor to watch, among the predominantly European gymnasts. She has a lot of enthusiasm and a very expressive presence on the floor. I really liked her make-up and leotards. I especially like the black and green combination. The gymnast from Argentina, Ana Milagros Carrasco Pini, is also very interesting. I haven't watched a strong Argentine gymnast since the last time I saw Anahi Sosa. This gymnast is very different from Anahi. She is all about being fierce, expressive and dramatic. I am very happy she made the ribbon final where she performed in a black leotard and a bright yellow ribbon (video to come soon). 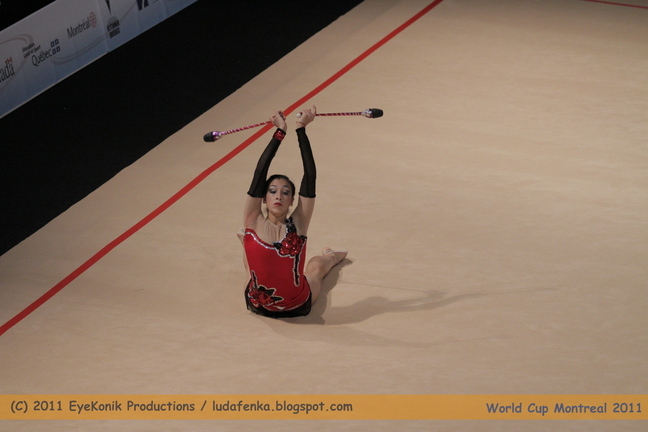 Here are some pictures showing the unmistakably dramatic style of this gymnast. Quite different from the bright-colored and dramatic style of Ana Milagros, the Finish gymnast Silja Ahonen stood out with her beautifully braided hairstyle and soft-colored, but truly glamorous, leotards that emphasize her beautiful figure. Silja had a bit of a mishap with ribbon that we caught on camera. She and the ribbon had different ideas of how to finish the routine. But she certainly remained very poised and very cute throughout. Please visit my blog again for pictures of the Americans Shelby Kisiel and Julie Zetlin, Kazakhstan prima Anna Alyabyeva, as well as the Russian stars Lukonina and Mamun.